Home / Unlabelled / AGAIN EMPLOYMENT OPPORTUNITY AT TARURA CHECKOUT HERE. AGAIN EMPLOYMENT OPPORTUNITY AT TARURA CHECKOUT HERE. 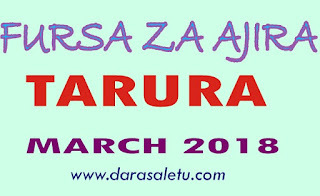 The Tanzania Rural and Urban Roads Agency (TARURA) is an Executive Agency established under the Executive Agencies Act Cap.245 vested with mandates of developing and maintaining rural and urban road network. The overall goal to establish the Agency is to have improved and all weather passable rural and urban roads.